Okay, so I know I haven't been very good about posting lately, life has been hectic! But I'm resolving to get back to serious posting again! A couple of weeks ago my husband and I finally gave in an joined the iPhone crowd. Oh yes, I was fighting this one, but he just kept persisting. Immediately, I knew I was in trouble... and now just two weeks later I can't imagine what life was like without the iPhone. But there has been one particular app that has made the ENTIRE switch worthwhile... The Disneyland Walkee iGuide app. This one is an absolute must have for any Disneyland visitor! I would have paid far more than the $2.99! As you know, we are avid Disney (freaks) with annual passes who tend to go *ahem* about once a week on average. And no, I'm not kidding about that. We LOVE going to Disneyland and we make the effort every time we have the chance. The one thing that drives my husband absolutely crazy about Disneyland is the lines- he HATES them. That is exactly why I took the boys alone on the first day that the Finding Nemo ride was open, knowing full well there was zero chance of getting my husband to wait in the 3 1/2 hour long line. I left it up to the boys as to whether we would wait in the line and they were determined to ride it that day! So we waited for 3 1/2 hours in 90 something degree heat. And then we went back again just a couple of days later and waiting in the line AGAIN. You should have seen the laughter from the Castmembers as we got on the ride (for the 4th time) when they found out that my boys had already "found Nemo" 3 times and the ride had only been open for two weeks... For those that aren't aware, the waits for the ride were insane for months after the ride opened! 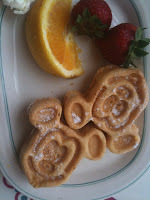 Last Sunday we got up early and had breakfast at the Carnation cafe on Main Street (LOVE the Mickey shaped waffles!) and plotted out our rides according to the wait times we foun d for the rides on our new Walkee iGuides. It made for a fantastic time because we knew how long the ride waits were for each ride before heading over there! The coolest part of the day was seeing that there was a nine minute wait for the Matterhorn (was only 5 minutes by the time we got in line), so we bolted over there after riding Big thunder Mountain. As we were waiting in line and scoping out the waits on the other rides, I saw another couple immersed in their iPhones! I smiled and asked if they were using the Walkee guide also. Sure enough they were! How cool is that? You can bet from here on out I will plan my next trip to Disneyland according to how long the lines look on the Walkee iGuide and diligently enter our own wait times after each and every ride. Love that there's "an app for that!" Mr. Tap here. So glad you enjoyed our Walkee iGuide to Disneyland Park. We are definitely proud of the app ourselves and love to hear other people going bananas over it. Now you have to check out the Tripulator, which is our spending calculator. Tripulator? Hmmm, I'll have to check it out. And yes, we are still avid users of the Walkee iGuide (about once a week actually!). I constantly have people looking over my shoulder at the park asking what it is, etc.